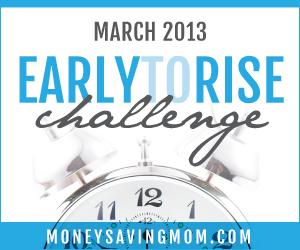 This is Day 20 of Money Saving Mom's Early To Rise Challenge! Wednesday night was rough for D-baby. I think he's headed through a growth spurt right now. He woke up around 2:30 am, so I brought him into bed with us ( bad mama!). I had a feeling I was going to have to fight him pretty hard to get him back to sleep otherwise. I hate when I'm right sometimes. Poor D-baby tossed and turned for 2 hours until I finally realized he could be hungry. Hubs ran downstairs and got him a cup of milk which D-baby heartily drank, smiled, handed the now empty cup to me, and curled up almost immediately asleep. By this time it was a little after 4:30. I didn't know how hard he was going to sleep so I just stayed in bed with him until 6. It was good to cuddle with my little love for a while. Day 20 is about silence and how hard it can be sometimes. I was pretty neutral on silence and whether or not I liked it until I became a mom. Now silence is something I crave unless the kids are awake. Then silence can mean trouble, especially coming from a baby. Then silence scares me. Our action tip for the day is to be silent in the car. No radio, or any other kind of device plugged in to distract you from the silence. To be honest, I never find silence in the car stifling. In fact, it's where I enjoy silence the most. If I'm in the car, 99% of the time, the kids are with me. Silence in the car, with the kids, means they're either asleep or they're observing the world going by. But it's a safe silence. It's a freeing, relaxing silence. Yesterday, in fact when we were out running errands, I had the radio off and didn't notice it until I was almost home. When I turned it on my oldest exclaimed "Hey, music!" as if it was something she'd never heard in the car before. Sometimes we observe silence even when we don't notice it. Being silent in my prayer life is one area I've never quite understood. 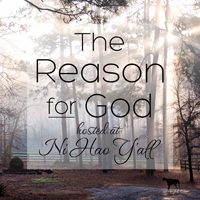 I believe silence in prayer is a good thing, a necessary thing, but how does it work? What does it look like? How do you DO silent prayer? The logistics are a little lost on me. What does silence during prayer look like for you? Any tips on how you do it?